Robert Adamson, an ironmonger to trade for a great many years, became manager of the Dundee Water Company in the latter years of his working life. He was declared to have displayed great judgement while carrying out that role. 74 years - although death certificate states 70 years. His death was registered by a neighbour, which may account for the inaccuracy. Robert Adamson began his career as an ironmonger. As a young man in his twenties, he plied his trade opposite Crichton Street. Through the years 1829-1838, he appeared in various Directories operating his business from 17 Overgate. By 1850 he had become the manager of Dundee Water Company. Continuing in that role for a number of years he tendered his resignation in 1864, by which time he had reached the age of 65 years. Robert Adamson, the son of Robert Adamson Jnr., merchant, and his wife, Jane Miln, was aided at the start of his working life through the estate of his grandfather (also Robert Adamson) who died in 1820. He embarked on the operation of an ironmonger’s business in Dundee for over twenty years. Thereafter, in his fifties, he became the manager of Dundee Water Company. Described as having been an “efficient and obliging manager,” he obtained the principal credit for the laying out of the grounds at Monikie, its appearance apparently much admired by visitors. After his retiral in 1864, Robert Adamson spent out his days living at Hermonhill House (with his sister Eliza), at that time having a “commanding view” – the fine terrace of houses fronting the Perth Road not yet constructed. 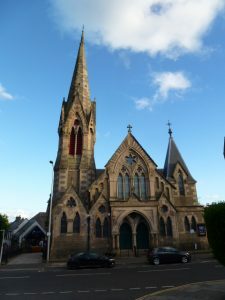 The building of St Mark’s Church on the corner of Perth Road and Greenfield Place (a stone’s throw from his residence) prompted Robert to make a grand gesture towards its bearing. To that end, Robert gifted a bell with the inscription “presented by Robert Adamson of Hermon Hill.” The bell which weighed approximately 17 cwt., and was cast by Messrs Warner & Sons, London, was said to have possessed a clear and bold tone. Many charitable institutions and other worthy causes benefited from the mutual disposition of the estate of Robert Adamson and his spinster sister, Eliza. The estate was a sizeable one amounting to over £22,000. Among the beneficiaries were: schemes of the Church of Scotland; the Kirk Session of Dundee; Dundee Royal Infirmary; the Industrial Schools, the Orphan Institution; the Female Society; the Indigent Sick Society; the Deserving Poor; the Clothing Society and the wonderfully named Decayed Gentlewomen’s Society. Old Parish Registers. Dundee. 1798. 282/ 80 256. ScotlandsPeople website. Statutory Registers. Dundee. Deaths. 1873. 282/ 1 34. ScotlandsPeople website. Dundee Postal Directory. 1842-43. Dundee Central Library, Local Studies. Dundee Postal Directory, 1850. FDCA website. Voters' Roll, 1865-1866. FDCA website. Western Cemetery Burial Lair Records. FDCA website. Dundee Courier. 4 January 1871, p.2. Findmypast website. Dundee Postal Directory, 1837-38. Dundee Central Library, Local Studies. Dundee Postal Directory, 1842-43. Dundee Central Library, Local Studies. Dundee People's Journal, 25 January 1873. p.5. Findmypast website. Dundee Postal Directory, 1834. Dundee Central Library. Local Studies. Dundee Postal Directory, 1864-65. Dundee City Library, Local Studies. Dundee, Perth and Cupar Advertiser, 2 December 1864. Findmypast website. Legal Records, Wills and Testaments. Brechin commissary Court. 1821. CC3/ 3/ 15. ScotlandsPeople website. Legal Records, Will and Testaments. Dundee Sheriff Court. 1881. SC45/ 31 30. ScotlandsPeople website. Dundee Courier. 3 August 1881. p.2. Findmypast website. The information above about Robert Adamson has been collated from a range of digital and hard copy sources. To the best of our knowledge it is correct but if you are relying on any information from our website for the purpose of your own research we would advise you to follow up the sources to your own satisfaction. If you are aware of an inaccuracy in our text please do not hesitate to notify us through our Contact page.